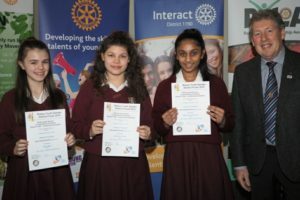 On Saturday 2nd February three Year 9 pupils competed in the annual District Rotary Public Speaking finals held at Windermere School. The views of the snow covered Lake District were impressive and so too was the Our Lady’s trio who had chosen the topic of whether the voting age should be lowered to 16. Disappointingly, the girls were not able to secure one of the top two positions and thus proceed on to the regional finals; Kate Moir was, however, awarded the prize for best speaker.